Hi everyone, Jura Clapman here, I am a Senior Program Manager working on the Feedback Hub. Did you have a chance to see the article about the new Feedback Hub app a while back? I wanted to give you some additional information about the new discussion and response features we’ve shipped over the last several months. We're always thinking about how to make the Windows Insider program better and listening to your feedback – thanks by the way, it really helps us deliver the features you want. My team and I stepped back, looked at the feedback gathering experience, read your feedback, and realized that we wanted to involve you all more deeply and show you in more detail how our engineering team is taking action on your feedback. Yes, we've always used the blog posts to highlight new features you asked for and fixes for bugs you’ve found, but that's not the same as being able to respond to specific pieces of feedback directly. We love reading your feedback, hearing your ideas, and even sometimes cringe at the bugs you're seeing. While here within Microsoft we are able to talk to each other about the feedback & bugs, we wanted more discussion with you, and we have heard that you all want to talk to each other – after all, great discussion is at the heart of connecting people together. We thought about all the ways you could help each other, and build on each other’s great ideas, by being able to let others know, "hey, great idea, and I have a thought to make it even better!" or "I ran into that same bug, but I found a great workaround that I can share with you." As we thought about this, the idea of community began to take shape. We envision a community of people who love Windows and want to make it better. We designed the discussion and response features specifically to allow a community to form among all of you who are so passionate about our products and Microsoft engineers who want to talk with you. It's not just about responding to your feedback, it's about creating dialogue between us all, sharing ideas, and talking about how we can make the Windows experience better for everyone. First, came sticky comments. You saw those for the first time back in March with build 14291. This was our first opportunity to publish responses to feedback, directly inside the app. Before this, we had the "More info" tags you may have seen on feedback, that linked to other content like a blog entry or Microsoft Community forum post. That was a great start, but community is about having great discussions back and forth – we wanted more and you did too! Sticky comments are a special kind of comment that will always show up at the top of the comment thread so they're easy to see, and the person who posted it will be tagged as a Microsoft engineer so you know it's legitimate. These comments will mostly come from the Community Champions you may have seen on Twitter, the Microsoft Community forums, and elsewhere. The Champions’ role is to represent your voice inside their engineering teams and vice versa. They'll use “stickies” to speak on behalf of their teams, to respond to your feedback and let you know what the team is doing to address it. In Samer's blog post about what we do with feedback, he discussed how we analyze and reason on all the feedback you send us. Many of you have talked about the amount of duplicate feedback there is in the app; we see it too and are working to make it better. We’ve built a way to group duplicate feedback together in the internal tools we use to track and take action on your feedback. We group the feedback into what we call “feedback parents” that let us see how many upvotes there have been on a topic in total, including feedback given in different languages and from different device types. Feedback parents help us make sure everyone's voice is heard. Sticky comments are built on these feedback parents - all of the feedback under a parent gets the same response at once so that no matter which feedback you look at in the app, you’ll see the same sticky comment. It’s important to us that all Insiders who reported a similar issue or suggestion find out what we’re doing to address the feedback. So far we've posted sticky comments on over 500 feedback parents, which collect together more than 45,000 individual pieces of feedback along with 2.75M upvotes. 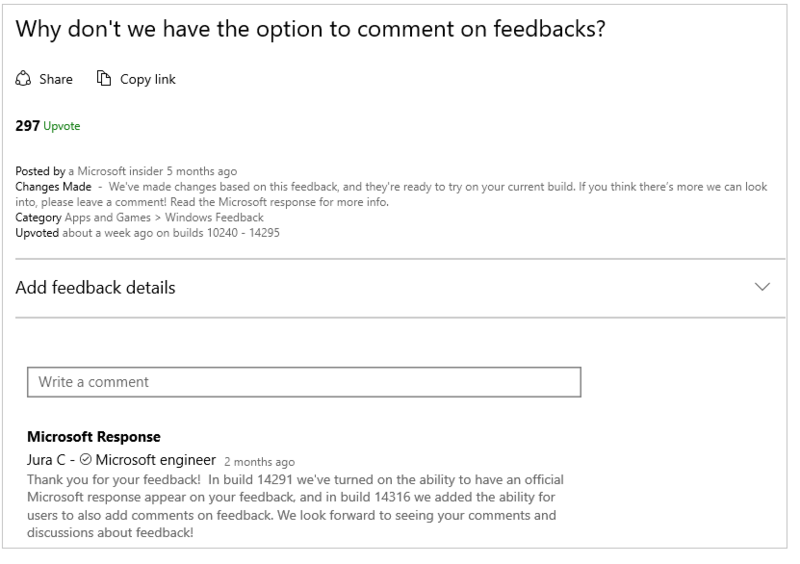 In build 14316 we shipped commenting, the backbone of creating community. Commenting lets you talk to each other, and lets us talk to you in a real dialogue. With comments we can get more clarity on your feedback and have more detailed discussions with you about what you’re seeing and what you’d like to see us change. You may have seen me or other Community Champions jump into discussions to answer questions, or otherwise respond to what you're saying. Like with sticky comments, we'll always be identified as "Microsoft engineer" so you can know the comment is coming from Microsoft. I can tell you, we're having a blast with this and I hope you’re enjoying talking with us too! The last new feedback feature lets us put short status tags on feedback to let you know what we’re doing with it. The goal of these tags is to give a short-form status on feedback we’re actively working on or have shipped changes for. For a long time now you've been seeing the Received tag, and some of you have noted that it's sort of odd and doesn't really mean anything because everything says "received" – you’re right! Part of shipping this feature was to tag feedback with something much more useful. You'll often see sticky comments published alongside a tag; the sticky will give more context on the tag: what the team did, workarounds until they can get a full fix out, or a description of the thinking behind the changes. These status tags went live in May – Insiders on builds 14325 and up can see these now. We’ve already published these tags on over 56,000 individual pieces of feedback with almost 4M upvotes. We've got it - this is the first tag that every piece of feedback will get. We see all the feedback, even if we can't respond to everything or address everything. Looking into it - when teams are ready to dig into a piece of feedback, they can set this tag to let you know they're investigating how they can improve the experience. They may find they don't have a great path to solve it, or it may take a long time to get it right, so this doesn't necessarily mean you'll see a change in the near future. Working on it - Sometimes, there are tough issues that take time to completely solve. There may be several root causes for a symptom users see, and making one fix may not fully solve the problem for all users. Performance issues and crashes are examples where this may be true. We’ll use this status to let you know we made some changes, but the team may have more work to do before they feel confident in calling it done. Things may stay in this state for a while, and once this state is set you may not see your issue go away right away. Changes made - once a team has built changes related to feedback and sent them out in a new build, they can set this tag. When you see this, you can know changes are coming. The team will be looking at your comments to see if you're satisfied with the changes or if there's more you'd like them to look into. It’s been really fun seeing you use these new features, and interacting with you inside the Feedback Hub app. THANK YOU for your passion for Windows and for taking your precious time to send us your thoughts! In the Feedback Hub team we're all really proud of these changes and it's incredibly satisfying to see people use our new features. There's a whole lot more we want to do with feedback and community in the future. We have a lot of ideas, and I know you do too! Please keep the feedback coming, we look at all of it and are always considering your interests first when we think about how to make the Feedback Hub experience better.